process (Midi technology was used); students gain needed sureness and confidence. Also, playing with other students in a live setting becomes less intimidating. A) Allows the student to study the prerecorded examples before actual practice begins. B) Increases the ability of the student to play with or without other players. C) Aids in the development of a strong sense of tempi and beat subdivisions. D) Instills a deeper sense of satisfaction and accomplishment. A) Once students (especially young students) leave their teacher’s studio, remembering and utilizing what was said and demonstrated can be difficult. Having something to see and hear (play along with) during their weekly lessons and daily practice sessions makes things easier to recall and accomplish! To insure easy and gradual indoctrination, the first few pieces are purposely short. 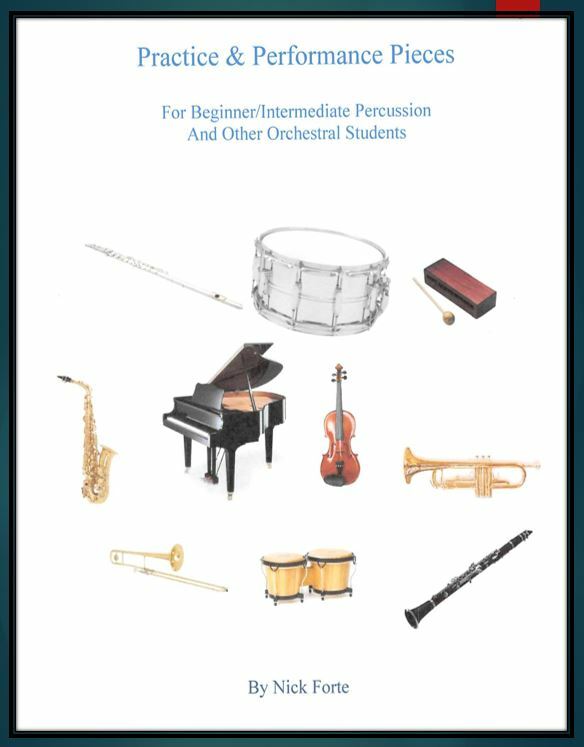 B) Students are encouraged to practice with and without the recorded accompaniment. Students of various ages may come together to demonstrate their abilities and progress for fellow students and parents. An important point is that the student can perform the pieces with the supplied recorded accompaniments or (as in the case of a music school setting) have other students play the supplied printed accompaniments-e, piano students, etc. IT IS ALSO POSSIBLE TO HAVE THE PIANO STUDENT INCLUDE ONE OF THESE PIECES AT HIS/HER RECITAL – WITH A DRUM ACCOMPANIMENT! C) During the process of practicing along with prerecorded music, the student is exposed to the concept of playing in steady tempi. Perhaps the most difficult part of playing in an ensemble is to play “in time”- or “in tempo” as it is sometimes called. Also, beat subdivisions (various note values within a one beat count) are played more accurately. These skills are vital for all instrumentalists! D) It goes without saying that when students enjoy a learning experience, they are likely to practice more while expecting higher levels of accomplishment. Performing in school recitals and other programs is a wonderful way to instill the confidence and control that every young musician must acquire to be successful.